Chopped mangos and avocados give this chicken salad a summery appeal. But you won't believe what gives the dressing its lemon-kissed flavor! Mix yogurt, mayo and milk until well blended. 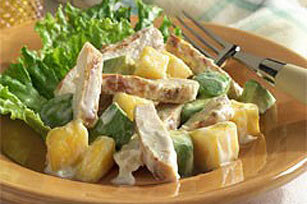 Toss chicken breast strips, mangos and avocados with 1/2 cup of the yogurt mixture. Spoon evenly onto lettuce-covered plates. Top evenly with the remaining yogurt mixture. Serve this flavorful salad with a whole wheat roll. Prepare chicken salad as directed; spoon evenly onto 9 large lettuce leaves. Roll up. Secure with toothpicks, if desired. Makes 3 servings, 3 wraps each. Store at room temperature until ripened.